Another piece came up this morning in the New York Times blog. It referenced a project we have been very involved in, Hario gear. 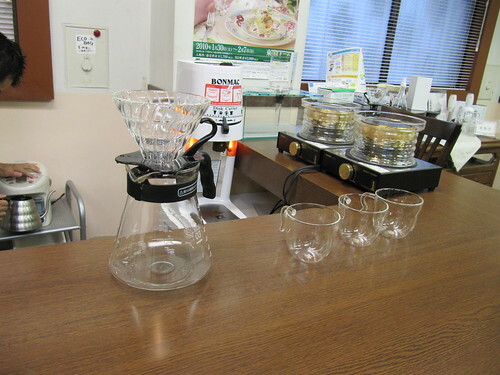 In December of 09, we visited Hario Japan's offices in Tokyo. We learned a lot, shared a lot, and are looking forward to new products coming out this year. It was a unique experience and came after at a time when we had recently invested a lot of energy using the Hario gear on our coffee bar. Hario has been a long road for us but it's just the beginning. We are happy to announce we will be the regional representative for HarioUSA. Beyond working to support Hario product distribution in New England, we will be doing training and bar setups for cafes wanting to execute a precision and efficient per cup bar. Part of that will include a lot of training with kettles but it will also involve another product from a new engineering startup. More details and a full review on that in three days. We will be looking for cafes who want to be on the leading edge with the Hario v60 gear to get in contact with us soon. Get ready for a new wave of per cup brew bars!